A General Admission Weekend Pass includes an official Firefly pass and access to all festival days and performances. Wristbands will be shipped prior to the event to the address provided at checkout. Get tickets now to ensure the lowest price! Wristbands will ship prior to the event to the address provided at checkout. Room upgrades and extra nights available for additional charge. Enjoy Firefly in luxury, from your private suite atop our VIP Loft at the Firefly Stage. Suite holders will enjoy Super VIP access as well as in-suite hospitality, catering and concierge services. Early Bug Special Pricing will only last 24 hours, and will begin at 12:00 Noon Eastern on Friday December 14. Get tickets now to ensure the lowest price! A Friday GA includes an official Firefly pass and access to performances on Friday, June 21. This DOES NOT include access to the Campgrounds. A Friday VIP includes an official Firefly Pass and access to performances and VIP amenities on Friday, June 21. This DOES NOT include access to the Campgrounds. A Saturday GA includes an official Firefly Pass and access to performances on Saturday, June 22. This DOES NOT include access to the Campgrounds. 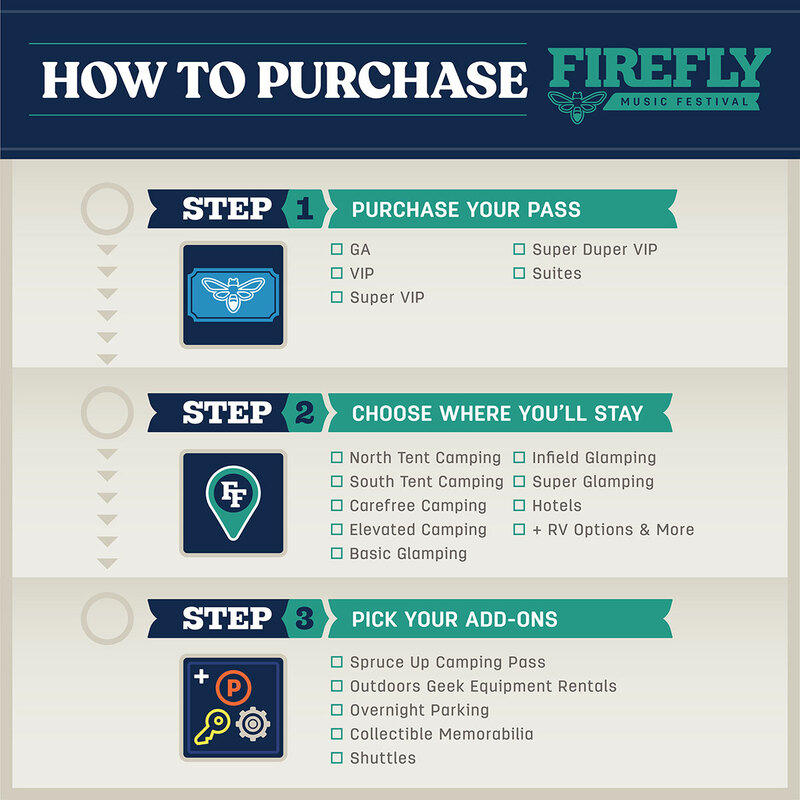 A Saturday VIP includes an official Firefly Pass and access to performances and VIP amenities on Saturday, June 22. This DOES NOT include access to the Campgrounds. A Sunday GA includes an official Firefly Pass and access to performances on Sunday, June 23. This DOES NOT include access to the Campgrounds. A Sunday VIP includes an official Firefly Pass and access to performances and VIP amenities on Sunday, June 21. This DOES NOT include access to the Campgrounds.